Niobe was a Queen of Thebes in Greek mythology and was used as the prime example in antiquity of hubris, the excessive pride and arrogance of man, for Niobe believed herself to be superior to the gods of Ancient Greece. ​Niobe was the Queen of Thebes for her husband was Amphion, a son of Zeus, who had taken the throne, alongside his brother Zethus, from Lycus. Importantly Niobe was the daughter of Tantalus and Dione (or perhaps the Pleiad Taygete), making Niobe sisters to Pelops and Broteas. Niobe therefore was of course a member of the accursed family of the House of Atreus, for the actions of Niobe’s father Tantalus would curse the family line for many generations. Initially, the curse seemed to have bypassed Niobe for the daughter of Tantalus flourished, as did Thebes with the building work undertaken by Amphion, and Niobe would be blessed to give birth to a number of children. Ancient sources do not agree about how many children of Niobe there were, but it was probably somewhere between 12 and 20, with an equal number of sons and daughters born to the Queen of Thebes. Niobe would bring about her own downfall, or maybe it was the curse, for arrogance would overcome her. Niobe would question why the people of Thebes worshipped unseen gods, when Niobe herself was as beautiful as any goddess, and she believed that the achievements of her husband and herself in Thebes were equal to the achievements of the gods. Niobe also pointed out that she was a granddaughter of Zeus. Niobe would also make the proclamation that she was greater than Leto, the Greek goddess of Motherhood, for whilst Leto had produced only two children, she had given birth to many more. Of course the children of Leto though were two powerful deities of Mount Olympus, Apollo and Artemis. Some sources claim that it was Leto herself who was affronted by the remarks of Niobe, and others claim that it was Apollo and Artemis who were angered for the slight to their mother. In either case, it was Apollo and Artemis who travelled to Thebes, and when there they unleashed their arrows. The target for their wrath was not Niobe, but the children of the Queen of Thebes, and the pair of gods would kill them all. Some say it was Apollo who would shoot the sons, whilst Artemis shot the girls. The massacre of the children of Niobe was generally considered to have happened with the palace walls, although occasionally the sons were said to have been killed upon Mount Cithaeron or on the plains outside the city walls. Amphion and Niobe were not killed during the massacre of their children, although it is commonly said that Amphion committed suicide when he found all of his children dead. 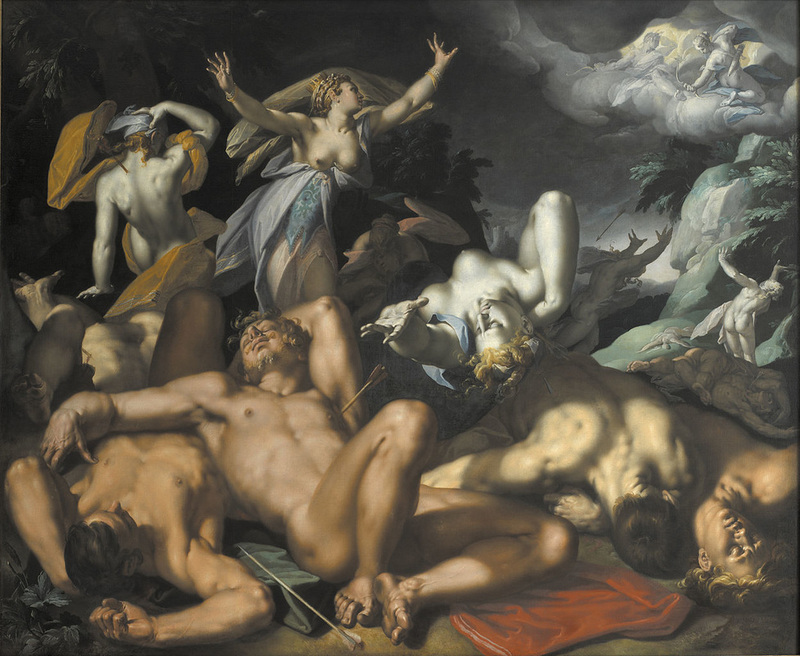 For nine days the bodies of the deceased children would go unburied, for Zeus had turned the people of Thebes to stone to prevent them assisting the impious Niobe. Niobe herself was said to be too distraught to do the burying, for the whole period the Theban queen was said to have wept, not moving or eating during that period. Eventually the gods themselves were said to have buried their children of Niobe, and indeed, in antiquity a tomb to the Niobids was said to exist in Thebes. Niobe herself would depart from Thebes and make her way to the homeland of her father. 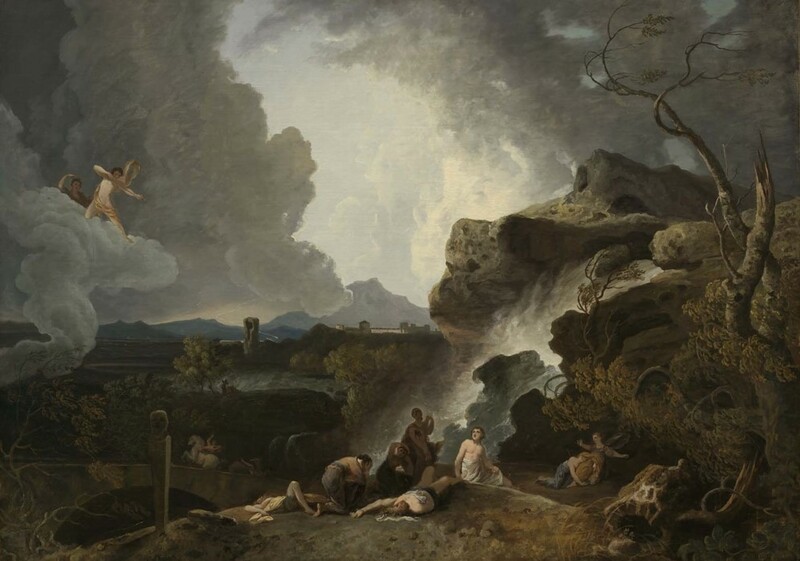 Upon Mount Sipylus Niobe would pray to Zeus to end her suffering, and in response to the prayer Zeus transformed Niobe into a rock that wept tears for evermore; some sources claim that it was Apollo who did the transforming of Niobe. In the earliest versions of the story of Niobe, none of the children of Niobe and Amphion survived the attack of Apollo and Artemis, but letter modifications of the myth did see children surviving because they offered up prayers to Leto. One daughter, Meliboea, may have survived, but the experience left her pale with terror, and so there after Meliboea would called Chloris, the pale one. Possibly one son also survived, this son being called Amyclas.